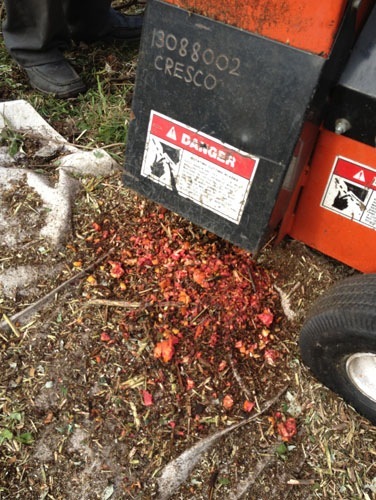 Time for the mostly annual chipper/shredder rental this weekend. 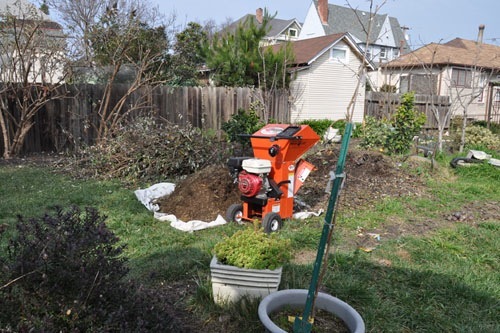 Many years ago I actually bought a very disappointing chipper/shredder for relatively cheap from Harbor Freight, and it just wasn't able to do much of anything. Most of that was that it was electric, the other part was its totally inferior construction. It's easier and less hassle to just rent one when we need it, anyway. Until it comes time to get it out of the truck. We got all cocky with our new truck ramp, and then discovered that we could not get the thing down the ramp because it is too wide. 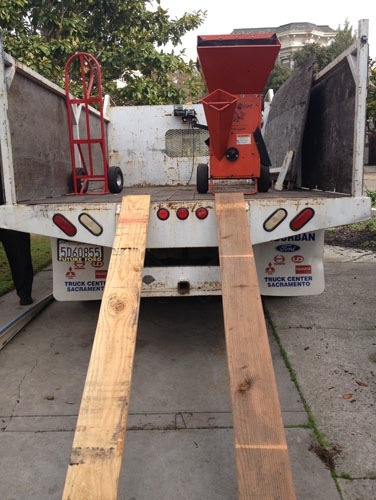 So we used a couple of boards, me standing on a pallet at the base of the boards to keep them from sliding, and Noel guiding the shredder down them with the help of the truck's winch. Thank goodness for that winch. We had two large piles of brush and stuff to get through, plus a few things hidden around the yard. 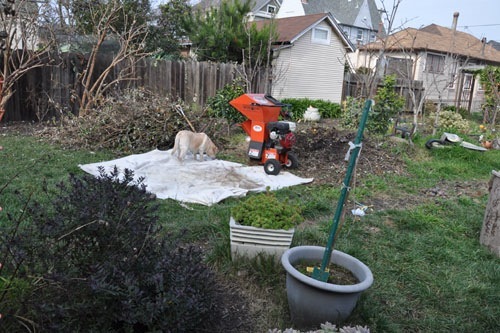 I laid out a tarp to make collecting the mulch easier, and we got started. After a while the tarp filled up and we stopped chipping for a bit to move it to the compost. 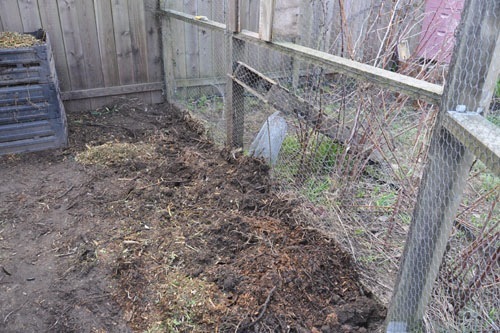 This also meant moving compost piles around because we need to make a small repair to the chicken yard. 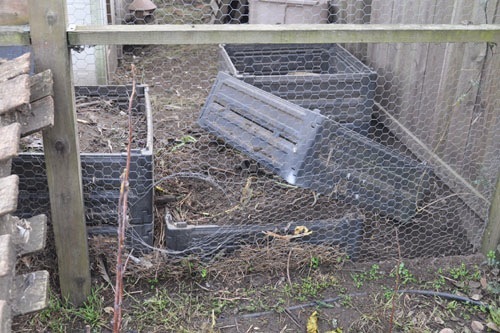 That would be this, which is where Rosie basically chewed a hole in the chicken yard fence to get in, then knocked over the compost bin. Labradors: putting the motivated in food-motivated. So much for the diet I have her on to lose a little old-age weight. Anyway, repairing that means pulling down that wire and replacing it (I have some 1/2" hardware cloth that will do the trick). And that means moving those compost bins and the compost in them. Which took an hour or so, but that's not too bad. We found even more holes in the fence in the process. Stupid dogs. 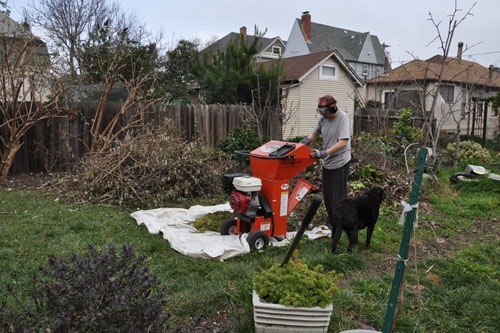 Then it was back to our work on the piles (with a brief interlude to go do something kind of moderately insane in Oakland, which I will write about tomorrow). I'm not sure if this illustrates that Goldie is deaf, or why Goldie is deaf. 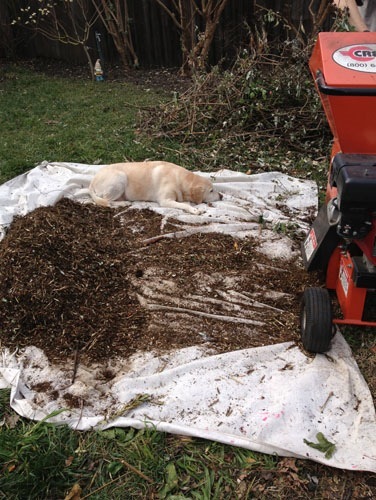 She certainly never napped on the tarp by the chipper before. She kept getting hit with the chips so I raked some of the pile to protect her, since she obviously did not want to move away. 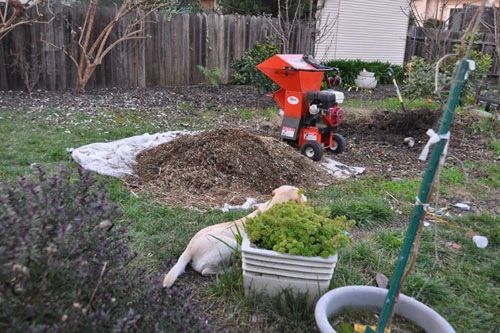 And then at the end of the light, we had finished the big piles of branches and Noel was working on shredding up the stuff in the compost pile. It's slower going because it is so wet that it tends to make the chipper want to stall out. That was not even in the plan for today so it was pretty much a bonus, so I was not at all disappointed that this was as far as he got. And some good fun: one of the piles was full of blood oranges from when I thinned the tree a few months ago, so we sent them through to see how it would look. Spectacular.